Your green room should be on 24 hours per day. Your plants do not need sleep and there is no required dark time for them to make roots. You will loose 42 hours per week if you run at 18 hours per day. That’s almost 2 days per week your loosing of growing time. We find that it only takes about 4 weeks at 24 hours of light to get the plant 4 feet high. Another advantage to 24 hours is that the plant will respond more quickly when put into the 12 hour cycle for budding. If you need to switch photo periods then always let it be on the dark side. For example say you have been running the lights during the day from 8am to 8pm. Now its getting warmer and you want to run your lights from 8pm to 8am when the day is cooler. To switch from day to night let your room sit in the dark for the extra time. In this example I would not turn the lights on at 8am as usual and let it be dark till 8pm. This will give the plants an extra 12 hours of darkness but will not cause shock. If I turn the lights on and give them the extra 12 hours of light then I take a risk of shocking them back into vegetation or worse, into hermaphordites. Your requirements will depend on the size of your grow. Figure roughly 50 watts per square foot. A 3 foot by 3 foot closet is 9 square feet, times 50 watts is 450 watts of light for maximum efficiency. Studies show that two 400 watt fixtures produce better light than a single 1000 watt light. I speculate that this is due to the area of coverage and overlapping lumens rather than the size of the bulb. 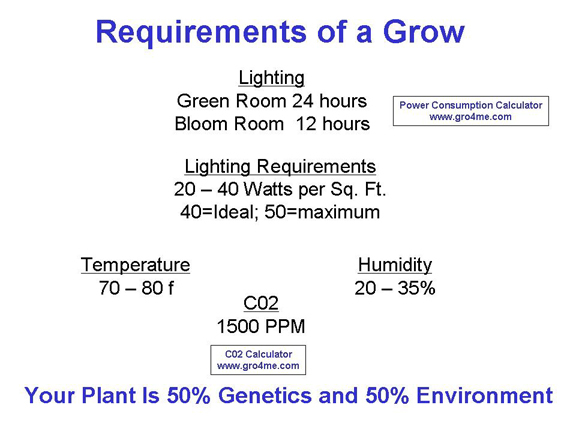 In the green room we use a standard 1000 watt metal halide bulb from GE. We have found that these less expensive bulbs seem to work the best. We also use a 1000 watt Sun Master Neutral Metal Halide bulb. This bulb throws the best array of blues and ultra violet colors. Studies have shown that UV is not beneficial for mmj but we have found that this bulb in combination with the standard GE has been a winning combination for results. The ideal temperature should be between 70 to 80 degreed f. The extremes are just above freezing and up to about 112 degrees f. It is not going to kill the plant if you have cold or warm days. It does have an affect on how fast and big the plant grows. It is not required that you install air-conditioning and large furnaces. It is important to reduce these extremes as best possible. In hot times keep the air moving extremely fast. In cold keep some heat in and do less ventilation when the lights are off. If you need to you can run a small heater, or even a small propane burner on low. This will not shock the plants. Burning a small flame also generates Co2, but be careful not to burn your garden down or create carbon monoxide. Ventilation at regular intervals is still required. Marijuana is not a swamp plant. It does not like high humidity or sitting in water. A good range for humidity should be between 20 and 35 percent. You can decrease humidity with ventilation. If you need more then consider a small air conditioner unit for your window. A small unit can be purchased for around 50 bucks and can be used as a dehumidifier as well as provide cooling in the hot season. We generally do not include much of this information in our lessons as we do not feel that there is a huge benefit for the small grower. We did not use any Co2 in our films, however we do use Co2 to augment our bloom room now. There is a Co2 calculator on our web site for you to use and links to additional information if you wish to learn more. Just a note about the size of your container or pot… Your plant will grow to the size of its roots. Just like the gold fish, when you put that little fish in a small bowl it stays small. Turn that little fish out to the lake and it may grow to be 6 feet long. The plant will react the same with your container. If you use a 1 gallon bucket the plant will be much smaller than if you had used a 5 gallon bucket. We use 10 gallon containers which may be too large for you, but use the largest container that reasonably fits in your grow. This same rule applies for outdoor growing. If your hole is only a foot by foot then the root ball will be smaller, thus the plant will be smaller. Outdoors dig and work a large area if the soil is native. This rule does not apply when dealing with genetics, in other words you cant make a small species large just by putting it in a 55 gallon container.